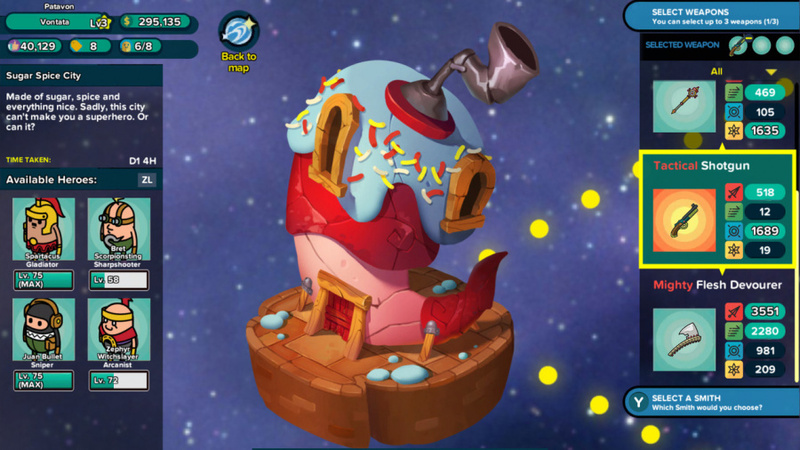 Published by Rising Star Games and developed by Daylight Studios, Holy Potatoes! A Weapon Shop?! is the first entry in the trilogy series to come to the Nintendo Switch. 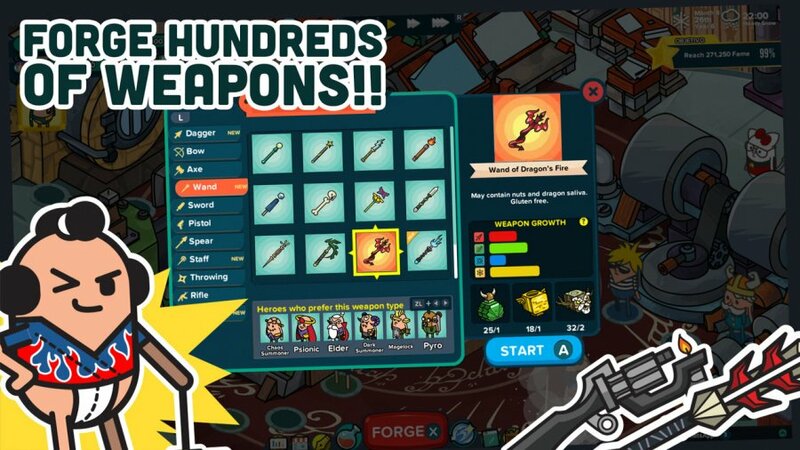 Originally released in 2015 on PC and later on mobile, the title has been inspired by games such as Weapon Shop De Omasse and Recettear: An Item Shop’s Tale. Basically, it’s a wacky-themed simulation game, where you manage your very own weapon shop whilst expanding the business across a potato universe. If you’ve ever played this type of game before, the concept of it shouldn’t be too difficult to comprehend. You start out as an inexperienced potato who has inherited less than one percent of a weapon shop. Despite the odds, your shady business partner is more than willing to let you run day-to-day operations. This is where you – as the player – come in. It’s your job to build the business from ground-up to make it the most famous potato weapon shop of all-time. 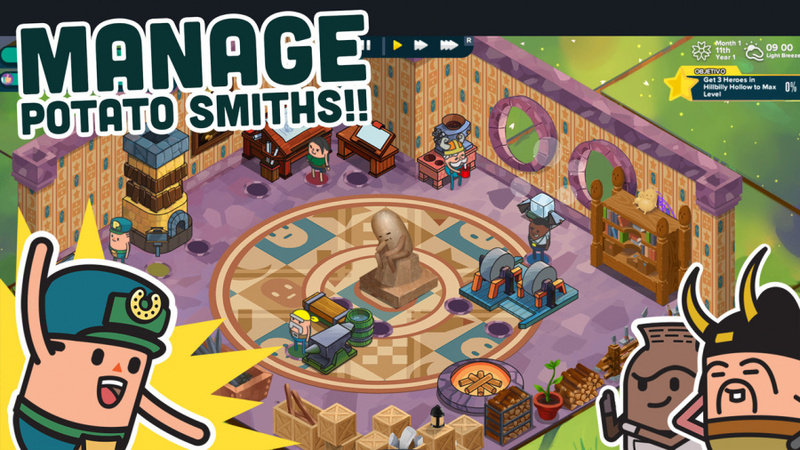 With the help of a couple of ‘potato smiths’ who are ready to forge weapons and sell them to heroes, your responsibility is to micro-manage the business by dishing out a bunch of commands. Embracing the daily grind is the first step to success. With more than 70 potato heroes to sell to and around 200 weapons to forge, most of your time will be spent gathering supplies, crafting and then selling to your clientele for fame and cash (known as $tarch). Your business can be expanded across 20 different areas over time and there are 30 different blacksmiths that can be managed. There are even 20 legendary pop culture heroes to discover and a potato dog to adopt – which fits nicely with the overall humour of the game, as excessive as the puns may be at times. The more time you invest in the business, the more opportunities pop-up. The game expands upon its foundations implementing more complicated management tasks that will put your business at risk if you don’t balance your finances correctly. Like the majority of other weapon shop games, whatever you do comes at a price. This could be in the form of a monetary transaction, or even at the expense of your business reputation. If you do fail to keep an eye on your funds, expect a visit from the weapon shop guild who are happy reimburse you a few times over before eventually shutting the shop. Each potato smith has a salary and for items to be made you must assign one of them to travel to other areas within the potato world and purchase specific crafting supplies. The weapons range from anything you would want to equip a hero within a traditional role-playing game. These can be swords, bows and even axes. Every time a weapon is forged you must name it. This gives you a personal connection and a sense of control over the business, which you must also name at the start of the game. As you go, you’ll be required to expand your shop in order to craft bigger and better weapons, and so you can house more blacksmith. The depth lies within the forging, selling, buying, and research system. How you build your fame and fortunes of your business from here is up to you. Every hero and potato smith has levels attached to them, which in return benefit your business and reputation. 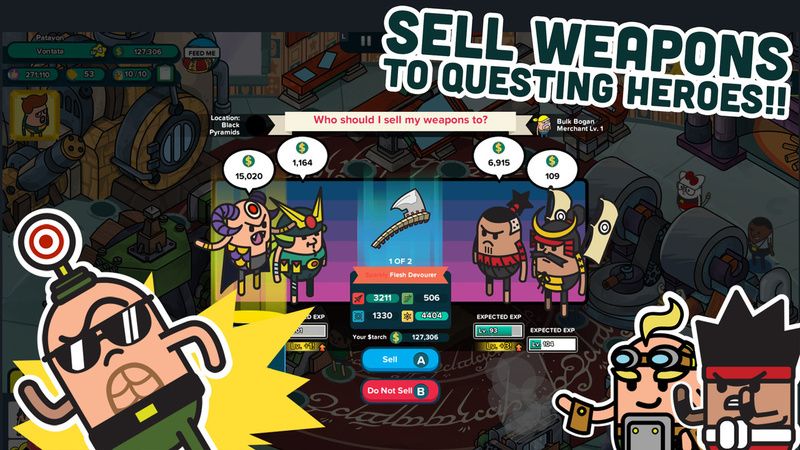 Every time you send out a blacksmith to sell weapons, there’ll be a range of heroes who will offer a certain amount of coin. For the sake of your shop’s fame, it’s important to assign the right weapon to the right hero so they can reach their maximum level. If you’re out for a quick cash grab, though, you can always take a risk and sell a particular weapon to a potato that doesn’t necessarily specialise in a certain area – for example, giving a fighter a bow instead of an axe. Each customer has specific needs, with each weapon catering to different primary skills. Different types of blacksmiths can also boost weapons in certain areas including attack, speed, and accuracy. Sales may also impact how your employees operate, with effects that change their performance for brief periods of time. Beyond the daily routines are a bunch of objectives you can fulfil like buying a number of materials and crafting supplies or selling a particular weapon to a specific customer. There are also timed tasks where you must craft weapons with unique stats and the ability to search the world for relics and enchantments. All of this adds some excitement to the job. In addition to this are randomised encounters with customers who will enter your shop and request certain items for a large amount of cash. It’s in your best interest to sort these individuals out as soon as possible. Regardless of how exactly you do decide to grow the business, there’s definitely a noticeable rhythm to the daily happenings, with plenty of unexpected challenges to overcome along the way. What undoes Holy Potatoes! A Weapon Shop?! is how poorly it’s been adapted to the Switch. While it performs reasonably well, it feels slightly inferior to existing iterations due to the clunky and confusing user interface. It doesn’t feel compatible with the Joy-Cons and even with the touchscreen, it can be difficult to move about menus. Speaking of which, the menus take up too much space on the screen, and if you’re playing in handheld mode the text and stats can look incredibly small at times. The tutorial isn’t exactly user-friendly, either. It sort of bombards you with a stack of text and information about how to run the shop all in one go, and continues to do so for a prolonged period of time. Despite how simple the day-to-day operations actually are, this alone may deter newcomers. In saying this, there is some welcomed quality of life features such as the ability to fast forward and pause time – making the title great for quick sessions when you’re out and about or only have so much time to spare. A bonus themed adventure titled ‘Spud Tales: Journey To Olympus’ has also been thrown in. One other aspect that can be commended is the music composed by the legendary Kimura Masahiko, who worked on the original score for the Castlevania series. 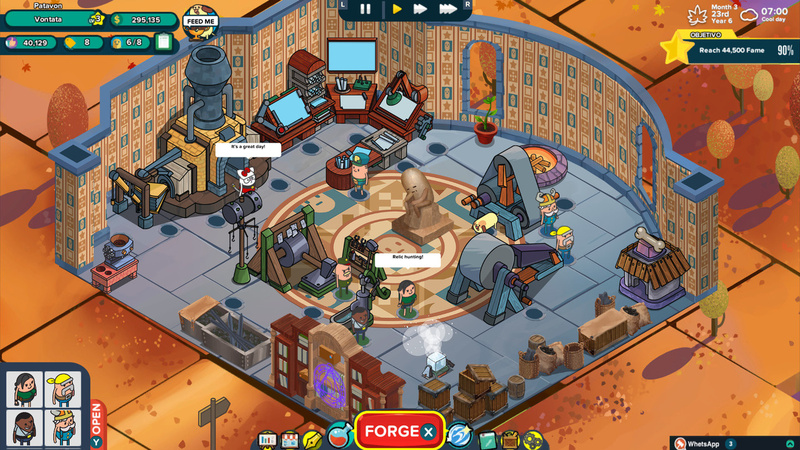 The music throughout the game provides a relaxing vibe and goes well with the cartoon graphics. Holy Potatoes! A Weapon Shop?! isn’t anything we haven’t already seen before. Forging and selling weapons is fun once you get into the rhythm of it, and there’s plenty within the potato world to work towards. This is a game that can be played for a few minutes or hours per day, depending on how much you enjoy the genre. What’s frustrating is how this title has been adapted to the Switch. It’s got a clunky user interface that doesn’t really feel compatible with the Joy-Cons and even if you opt with the system by itself as a touchpad it still feels difficult to complete the most basic of tasks. All up, this makes it the hardest version of the game to play. Overlooking these problems, it’s still worth checking out if you’re looking for a game of this type and one with plenty of humour – it’s just far from spud-tacular.